Found in the heart of Washington, DC’s Mount Vernon area is The Whitman—a contemporary condominium that is loaded with perks and amenities. Delivered in 2006, the structure offers a fascinating style with a seven-story front section inspired by row house design principles, backed with a 12-story main section. 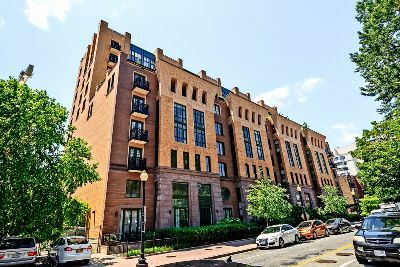 There are 185 very modern residences in this 12-story complex, located at 910 M Street NW between 9th Street and 10th Street. Models include one-bedroom, two-bedroom and three-bedroom residences with up to three baths. The floorplans range in size from around 700 to 1,700 square feet. Units on the seventh floor of the front section offer private roof decks while the 12th floor penthouse homes feature bi-level living and balconies. Step into the light-filled condos for sale at The Whitman and enjoy open-space concepts, hardwood floors throughout, giant windows, and gourmet kitchens set unobtrusively into the walls, with granite counters, custom cabinets and stainless steel appliances. The luxury baths with elongated vanities as well as walk-in closets and front-loading washer/dryer combos are also worth noting. Amenities are also a huge part of the appeal at The Whitman. Residents enjoy a 24/7 staffed front desk with concierge service, secure garage parking, a state-of-the-art fitness center and a club room with pool table, wet bar and flat screen TV. But that’s not all—the rooftop is stunning with its swimming pool, lounging area, gas grills, dining and spectacular views. Location is also key, with shops, bars, restaurants, theaters and museums all around. The Mount Vernon Square/7th Street/Convention Center Metro Station is right next-door, as is the new CityCenter complex with all its attractions. Also give a shout-out to next-door Chinatown and the Verizon Center, home to the Washington Wizards! For more info call District Partners Real Estate at 202-798-3600.